This book helps novice users understand the basic usage and operation of SharePoint Online 2013 that is available via the Office 365 Enterprise and Mid-Sized plans. It examines the following basic components of SharePoint Online: Documents, Calendars, Tasks, Picture Libraries, Recycle Bin, Search, Site Notebooks, Public website and more. The reader will be taken through a tutorial process on how to use each item. Much has changed since previous versions of SharePoint and Office 365, however there are still some similarities. This book may also provide some insight into the basics of SharePoint Online 2013 for Small Business Office 365 plans as well. It will show you how to start interacting with SharePoint Online 2013 so it can be put to use in your business as well as provide a number of resources for continuing familiarity with SharePoint Online 2013. 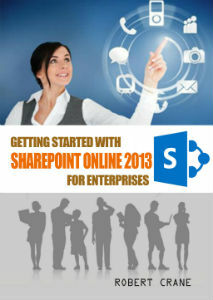 This booked is aimed at users who have never used SharePoint Online 2013 or Office 365 plans.